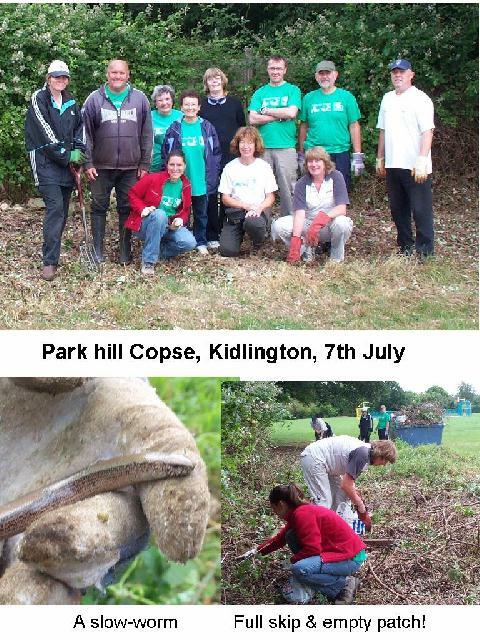 This is a new venture working in this park off Benmead Road, Kidlington, July 2009. Many hands really DID make light work, clearing a huge bramble patch and tons of litter, most of which we recycled. A second visit is scheduled in August. Bicester Green Gym's website is hosted by, but not compiled by TCV. The information contained on this website is for general information purposes only, supplied by Bicester Green Gym. The views provided by Bicester Green Gym are not representative of TCV. TCV is not liable for any loss or damage including, indirect or significant loss or damage, or any loss or damage whatsoever arising from loss of data or in connection with, the use of Bicester Green Gym's website. TCV does not endorse, control or approve the content on Bicester Green Gym's website.